So I just buzzed my first buzz. I’m not kidding about the bread-making, and I’m certainly not kidding about the blizzard. I was going to add belated to the post title. I kept on checking my Gmail, since I knew that to be the notification mechanism. But there was no email about it, so when I checked Gmail via my iGoogle home page, I seemed Buzzless. Then I went to Gmail itself, and saw the invite there, albeit not in a mail. In my crusty mood, I thought I saw a grumpy face on one of the baguettes I made. It is my new Google profile image, and hence my Buzz icon. Recent snowstorms have prompted my daughter (6) to ask if we are in a blizzard. It certainly looks like one outside. 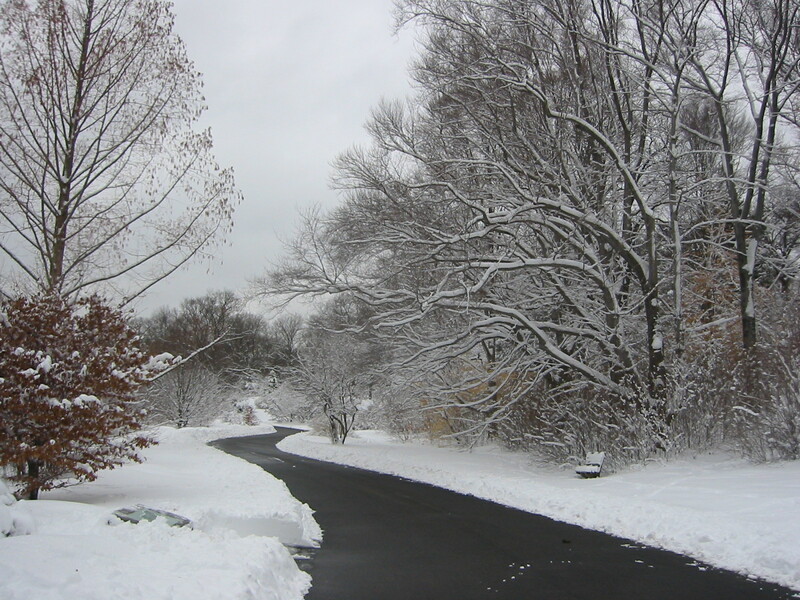 If we moved south because we didn’t like Boston winters, we picked the wrong year, or we didn’t move far enough, or… Anyway, the Washington Post reports that the DC region begins to dig out after record storm. Some areas, particularly in Southern Maryland, experienced wind gusts up to 40 mph. The total measured snowfall at Reagan Airport at 8:58 p.m. was 16.3 inches, but it was as high as 23 inches elsewhere in the region. That would be more snow in a 24-hour period than the region typically gets in an entire winter. Meanwhile Boston braces for a great white wave, and Universal Adam features the Snowmageddon tweets. I took the photo yesterday morning, less than halfway through the storm. It’s part of the rather good Flickr group Sprung from Silver Spring. Since my wintry words of yesterday, it has occurred to me that the few inches of snow we got in Boston really doesn’t qualify as a storm, yet is less snow than it took to shut down London. I’ve also found some clips of a BBC show from 10 years ago: Songwriters Circle. Here is the Crowded House song “Weather With You” done by Neil Finn, backed by Roddy Frame (Aztec Camera) on lead acoustic guitar and Graham Gouldman (10cc). This is the mountain of snow formed by clearing the parking lots around the Roche Bros Supermarket (and neighboring stores) in West Roxbury. Since I took this picture 8 days ago, we’ve had another snowstorm, resulting in Boston schools being closed last Wednesday, and it’s snowing again now. It’s also been snowing in the land of my birth (UK), so here are reports from a couple of the places I lived in when I was there. In Nottingham, the BBC set up a webcam at “Slab Square.” The camera captured a four-letter word, which wasn’t snow. Meanwhile, London pretty much shut down due to a snowfall that wouldn’t be out of the ordinary here in Boston. I found on Reddit a pretty good account of why London couldn’t cope with a scant few inches. Maddie, my almost-5 daughter, and I just dug out after the snowstorm. Here in Boston, we got about a foot of snow, but it was light and easy on the shovel and back. Folks elsewhere in New England are having a tougher winter. My old friend Richard stayed with us for a few days earlier this week. He requested that we go to Concord and to the Old North Bridge, so we did. The bridge proved to be particularly photogenic in the snow and ice. I chose that particularly image because it features the bridge itself, and loses less in the thumbnailing than do some of the others. But I think that my shot of the day was this one. Boston got another snow storm this morning. The kids’ childcare is closed today, along with pretty much every other school. Here’s a photo, taken from our kitchen, of our deck and the trees beyond it. I had a search round the web to try to find an MP3 of “Snow Day,” the Trip Shakespeare song. That’s the band that Dan Wilson used to be in, before Semisonic (and the Dixie Chicks). But I couldn’t find one, and so have to deny you the multimedia experience I wanted this post to be. specify things like color of background, swirlyness of snow, etc. use the image on your blog, other web page, in email, etc. Well, I would. If you know of a site where this is possible, please leave a link in the comments. If you thought I was leading up such a link, my apologies for stringing you along. Author andrewPosted on December 13, 2007 Categories Fun, Uncategorized, WebTags snow, snowglobeLeave a comment on Snow Globe 2.0?